Designed with passion in Belgium and made with love in Portugal. Since 2017 we've been besotted with this wonderful and refreshing collection. The Rembo philosophy is to take risks, set trends and continue to surprise brides with creations that have never been seen before, and they're committed to creating an artistic and unique collection for the truly modern bride. With a style to suit every bride, this collection has both a softness and an edginess that makes the dresses contemporary and timeless in one fell swoop! Is Rembo a go-go for you? Designed and made in London and worn by Sienna Miller and Jessie Bush. When you’re released into Charlie Brear’s unique and clever world of intricately beaded lace sleeves, delicate lace shrugs, sumptuous silk and over skirts, your options are endless. The designs allow you greater customisation opportunities to create your own bespoke gown. The collection uses the details and accents of decades gone by to offer a contemporary take on vintage glamour. A true treasure trove of design genius! Think you might be a #CharlieBrearBride? Designed in London by the incredible Gill Harvey and made and hand-beaded in India. Named after Gill's grandmother, the Eliza Jane Howell Bridal Collection has been designed for the modern day bride who would love to wear a dress that oozes with the charm and opulence of the golden age of fashion. 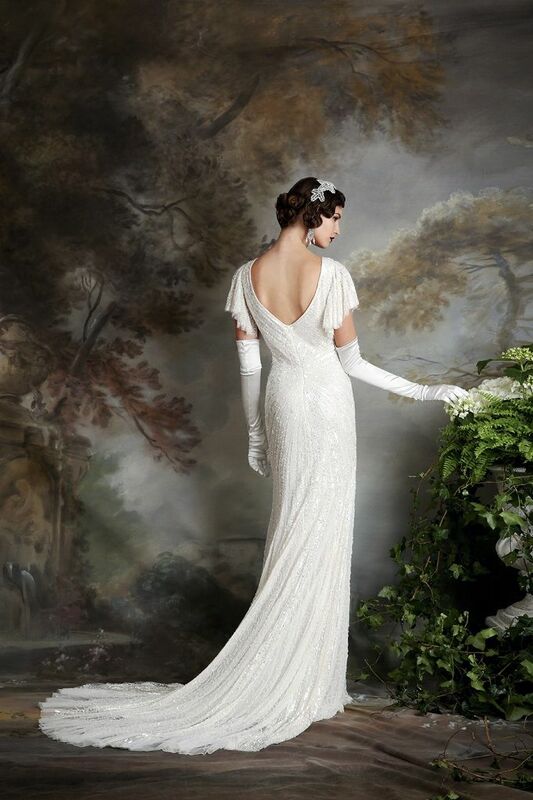 With inspiration from exquisite vintage gowns, the Eliza Jane Howell collection is the epitome of grown-up glamour. The deco-inspired beaded designs are sophisticated, decadent and impossible not to feel wonderful in! Does vintage glamour rock your world? Designed in Barcelona, and made to measure in Spain. The very beautiful Merche Segarra clearly designed the Jesus Peiro label with sophistication and elegance in mind. With such a contemporary and refined concept, you can see why we’re head over heels for them. The finish and detailing on these cool little numbers is second to none, especially in their striking use and mix of fabrics. The meticulous care displayed in the finishes – always done by hand – and the exclusive embellishments explain the prestige Jesus Peiro has gained in bridal wear all over Europe. Fancy bringing some Barcelona style to your big day?